Hm, my husband seems to think I have soapisitis, and sadly I think he’s probably right! Is there a cure for that?! I hope not! 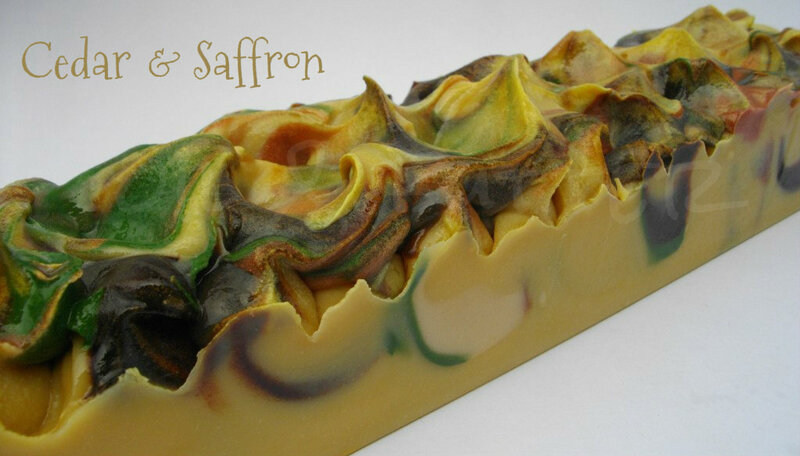 This soap is scented with Cedar and Saffron from Brambleberry, which is a really nice unisex fragrance, very natural and clean smelling. The swirls are colored with copper mica, cocoa powder, green oxide and super pearly white mica. The fragrance itself will discolour to a tan, so I left a good portion of the soap uncoloured. I used 1.5% sodium lactate this time, and it seems like a good amount to use - the soap came out of the mold easily and was ready to cut after 24 hours with no crumbles. I also used my new stickblender from BB (I’m on a Brambleberry role lately! ), and it seems to have really reduced the white spots in my soaps. I also completely melted the palm oil, to incorporate the stearic acid evenly, and that seems to have helped reduce the white spots too. Glad to hear the new stick blender is working wonders for you too! This looks lovely, can't wait to see it cut. Thank you Laura! Yes, it was well worth the investment, wasn't it?! Love this soap!!! The colors are amazing, please show them cut. Love the colorful swirls and the texture on top! I haven't tried Cedar & Saffron, but it sounds lovely. I ordered some sodium lactate with my last BB order and I'm curious to try it. Hi Jenny, thanks so much! It did accelerate a little bit, so it had a nice texture to play with. I really like this fragrance, it's smoky and fresh all at the same time...quite complex. I'm curious to know what you think of the sodium lactate when you try it. I really like the quality it adds to my HP and CP soaps. I think if I had tried it sooner, it would have saved me a lot of frustration. I would love to hear your experiences with it if you try it!